Coffee Bean Direct, online at coffeebeandirect.com, is dedicated to providing superior quality coffee at excellent prices. Coffee Bean Direct roasts and packs each order of coffee or tea immediately prior to shipment to ensure the best possible brew. Coffee Bean Direct offers a variety of coffee bean roasts, decaf coffees, coffee blends, flavored coffees, fair trade and organic coffee, loose leaf teas, herbal teas, green teas, black teas, unroasted coffees, and more. Coffee Bean Direct offers delicious brews for yourself or for friends and loved ones. But before you shop for the finest coffee and tea, get all the latest coffeebeandirect.com discounts, Coffee Bean Direct promotions, and Coffee Bean Direct coupon codes found here at RetailSteal.com. 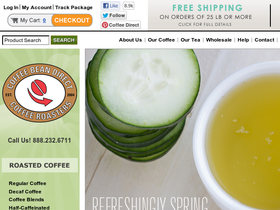 Coffee Bean Direct ships within the United States and offers expedited shipping options. See site for more information. Save $5 on your purchase from Coffee Bean Direct when using this coupon code on purchases $30+. Click here to shop. Enjoy free shipping from Coffee Bean Direct when you purchase 25 lb or more. Click here to shop. Shop the monthly specials happening now at Coffee Bean Direct for gourmet coffees from $6.70 /lb. Click here to shop. Shop for fair trade and organic coffees, starting from $8.80 per lb. Click link to shop. Pay only $7.50 for shipping on your purchase from Coffee Bean Direct. Get free shipping on your purchase 25 lb or more. Shop for a coffee lovers gift basket, starting from just $32 from Coffee Bean Direct. Click here to shop. Get the tea lovers gift basket for only $30.45 from Coffee Bean Direct. Click link to shop and enjoy.